RDF stores information in the form statements, given a set of statements one can derive additional statements. Inference & reasoning engine makes use of the class and property definitions, their relationships and additional rules to derive additional statements. Apart from deriving additional statements, inference engine also validates the data contained in the RDF graph for example the range and domain of a property. ?person rdf:type , ?person >60, ?person ‘yes’, states that all person with age greater that 60 are senior citizens. A rule-based reasoner applies such set of rules to RDF data and derives additional RDF statements. Rules can also be used to validate and secure RDF data. Classification of Data from User’s perspective. Visible only to the owner and instances can be created only by the owner. Can be considered as a database table/collection that is visible only to few users of the system say system administrators. An instance of either a Private Class or a Public class. Accessible only to the owner. Can be considered as a protected row in a database table/collection. Can be created only by the owner and can be a property of either a public or a private instance. Can be considered as a protected column/attribute in a database table /collection. An instance of a Public Class and is accessible to all. Can be created by anyone in the system and can be associated only to a public instance. Visible to all shared members. Instances can be created only by the owner and accessed by all shared members. An instance of either a Private Class or a Shared class. Can be created only by the owner and accessed by all shared members. Can be created only by the owner and accessed by all shared members. The below figure defines these rules, redarrow shows that the two entities can’t be associated with each other and the green arrows signifies a possible and must association between entities. At any given point of time all objects & links in the RDF graph must adhere to these rules to maintain sanity. Users are not given direct access to objects but are given indirectly by means of roles. Various roles are defined by the application based on accessibility criteria and objects are given access to one or many roles. Users automatically get access to the objects that their corresponding role has. Consider the below role definitions & accessibility rules illustrated as RDF graph. As per the illustration ‘Accounts’ is only accessible to ‘Ram‘ while ‘UserData’ is only accessible to ‘Sham’. Users are given direct access to objects as illustrated in the below RDF graph. 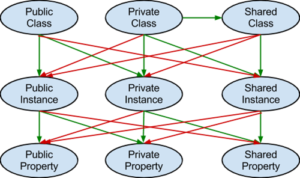 Owner of all classes, instances and properties present in the RDF graph. All security related classes, instances and properties that the superuser maintains for accessibility controls belong to the ‘Private Data’ category of the user. 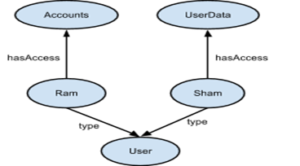 Explicit access is given to either private data or shared data in the RDF graph. The property ‘hasAccess’ is attached to the private node with value as a node with type – ‘Person’. The below illustration shows a part of a graph where the private data – ‘Ram’s payslip’ has access only to Ram. Sharing data in the RDF graph needs creation of a shared node whose links decide which node is shared by whom and for whom. For example, the below illustration shows that ‘Ram’ the owner of ‘Ram’s PaySlip’ has shared this node with ‘Shyam’. Implicit access is given to only public data in the RDF graph. The property ‘belongsTo’ is attached to the public node with value as a node with type – ‘Role’ as illustrated in figure 1. The ‘belongsTo’ property is private data of ‘superUser’ so as to prevent users from mistakenly make their data public. Hence it can be attached to nodes only by the ‘superUser’ OR by a user with whom this property has been shared by ‘superUser’ (typically would be administrators). Union of above three is returned to user as result to the query.